FANBOY PLANET.com . : Danny Elfman PBS :. At last, this is Halloween on PBS. For years, composer Danny Elfman has been making sporadic appearances with conductor John Mauceri to pay symphonic tribute to Elfman's film collaborations with Director Tim Burton. At last, someone has agreed to televise one. 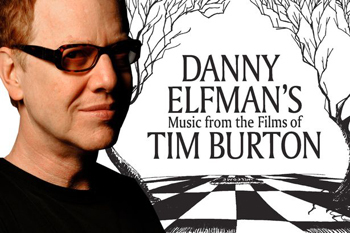 PBS announced yesterday that it will broadcast Danny Elfman's Music from the Films of Tim Burton as part of its Live From Lincoln Center series. Currently scheduled for October 30, 2015 at 9 p.m., the special will feature music from Batman, Beetlejuice, Edward Scissorhands, and The Nightmare Before Christmas. The concert will also be accompanied by film clips, sketches, and storyboards from Tim Burton. This comes on the heels of the announcement that Elfman will also be given the Disney Legend Award at the upcoming D23 convention in Anaheim, California. Considering how much impact The Nightmare Before Christmas has had on Disneyland alone, it's an appropriate honor. And no doubt the collaboration is far from over. But in the meantime, set your DVRs for October 30 and really get yourself in the right kind of mood for trick or treat.